When the queen is introduced to a hive, she's inserted in a small mesh box with a fondant plug. 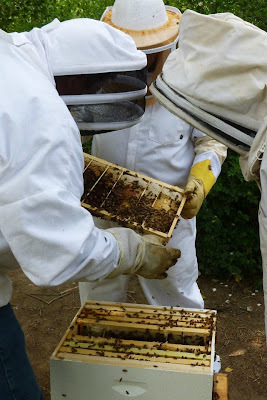 After the two days it takes the workers to eat their way through, they're used to her scent and she's welcome rather than killed as an intruder. 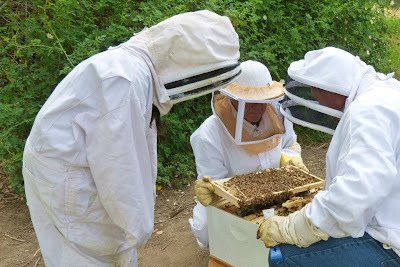 There are multiple breeds of honeybees. 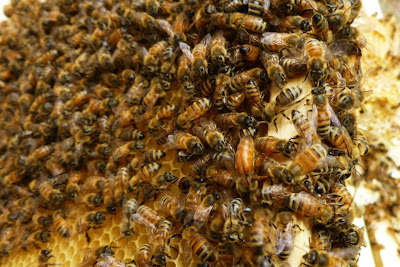 The hive is a blend of a couple of different swarms and this queen is from a generally placid breed. She should produce happy, mellow bees. One thing to look for when checking a hive is too many drone cells. The queen only takes one 2-3 day long mating flight in her lifetime, so not many are needed. A drone can mate within one week of hatching. Once he does, he dies. He's got no stinger and buggier eyes. Typically, brood cells - and the queen - are in the center of the box. The outer frames are the honey cells. She will lay about 1500 eggs a day, so she's pretty mobile. She does nothing else after her mating flight. Here we are, looking for the queen. It takes a month for a queen-less hive to produce a queen that can lay. 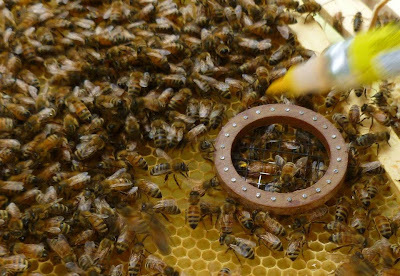 By that time, the drones can outnumber the workers and the hive is often irreparably out of balance. This is why it's important to keep an eye out for the queen. Still looking for the Queen. Three bee hoods make for a tricky huddle. There's the queen! 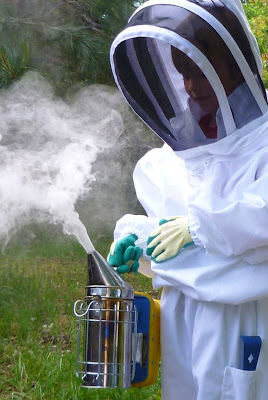 Though she can live for several years, most beekeepers "retire" their queens after one. Some are set into smaller boxes as back-up queens. Others are just squished. Now that she's been marked (with an enamel paint pen), she should be somewhat easier to find during hive checks. 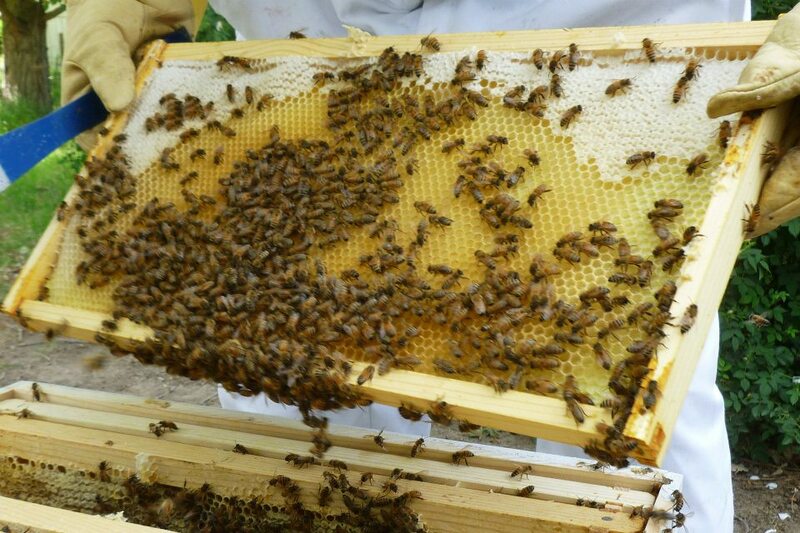 Once these frames are full of honey, a queen excluder will be added on top and a new box will be added. Her hips are too wide to fit through the excluder, but the workers can easily move up to the new box. 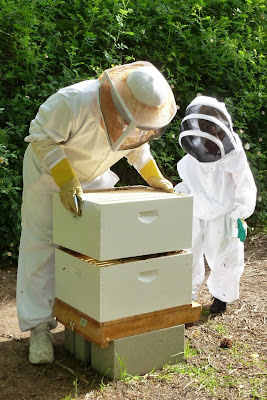 Any honey above these two boxes, which the bees need to survive the winter, may be harvested. Depending on how the summer goes, there might be a harvest this year!